At Coral Medical Health Spa the metagenics ultraclear age prevention program begins with a detailed health consultation with Coral’s Registered Nurse Practitioner. Once the initial age prevention consultation is completed, The Nurse Practitioner will determine what type of age prevention program is required. In the case of the ultraclear age prevention program, the nurse practitioner will provide the client with a specific untraclear meal plan and the metagenics ultraclear supplement required. The Metagenics ultraclear detoxification program consists of a powdered beverage (UltraClear, UltraClear PLUS, UltraClear MACRO, or UltraMeal RICE) along with a specially designed dietary program. In addition to the Ultraclear supplement our Nurse Practitioner will recommend you take a nutritional supplement called AdvaClear. The powdered beverages, supplement, and dietary guidelines are all designed to nutritionally support detoxification. Ultraclear contains specific amounts and types of protein, carbohydrates, and fats that are easily absorbed and used by the body. The key to assisting in the detoxification process of the body are the nutrients and phytonutrients found in the Ultraclear and Advaclear supplements. Based on you needs Coral’s Nurse Practitioner will determine which products you require. For optimal results you will be given a comprehensive dietary booklet with a detailed nutrition program to support the supplements you will be taking. Choosing from the products just mentioned, Coral’s Nurse Practitioner will design the best program for you. Additionally some modifications will be made to your program in other ways to better suit your particular needs. The more complete your communication is with Coral’s Nurse Practitioner, the better she will understand your unique circumstances, and the more “tailor-made” your program will be. The way you respond to these products and the dietary program will be determined by your uniqueness (your “biochemical individuality”) and the program that you have established with the nurse practitioner. Most of Coral’s detoxification clients begin to experience results within the first month. However some clients take longer to notice the results. You may also experience some transient reactions to the detoxification process including mild headaches, muscle aches, or changes in bowel habits. Generally these effects are minor and temporary. Another common side effect of detoxification is weight loss, although detoxification is not designed to help you lose weight, rather the main goal is to bring the body to an optimal state of functioning. 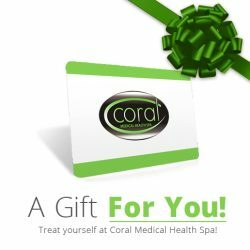 Careful follow-up and commitment to the ultraclear age prevention program offered at Coral Medical Health Spa results in creating the Detoxification response needed in the body. Customized based on individual needs. For more information or to schedule your initial consultation please contact Coral.